Johnstone Strait between Vancouver Island's north shore and the mainland is world famous as superb salmon fishing and orca watching waters. 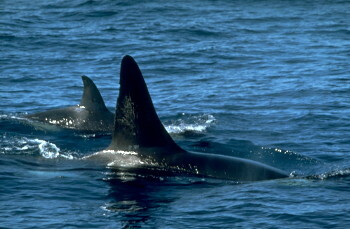 This area offers excellent opportunities to observe orcas, also known as killer whales in their natural habitant. Nineteen pods, totalling approximately 170 orcas summer in Johnstone Strait, feeding on the migrating salmon and other fish. Observe these magnificent black and white mammals almost daily as they spyhop, breach and dive. Robson Bight, a B.C. Ecological Reserve, is a bay along Johnstone Sound that has "rubbing beaches." Here orcas come in close to shore and rub themselves against the underwater pebble beach. Scientists and marine biologists are studying the reason why, but they might never learn the answer. 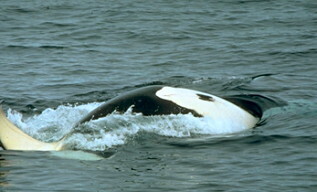 Near by are the towns of Port McNeill, Telegraph Cove and Alert Bay that serve as bases for whale-watching guided tours. These communities are also popular with kayakers and canoeists as a base for self guided trips. 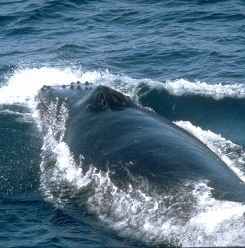 Humpbacks and greys are spotted now and again, in this region. In recent years, they have documented more than a dozen grays as summer residence in Queen Charlotte Sound. Both the Dall's porpoises and harbour seals are common and often sighted. The playful Pacific white-sided dolphins, are all along the West Coast and seen in Johnstone Strait. These enthusiastic bow riders and open ocean wave surfers are the latest marine mammal crazes for whale watchers. Pacific white-sided dolphins are popular because they love to bow ride and surf. They are fast, powerful swimmers that often leap and somersault.